The music world lost a giant in April: George Jones, White Lightening himself — the Possum. 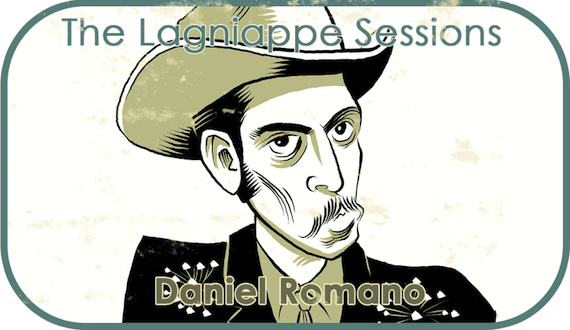 For this installment of The Lagniappe Sessions our favorite Canadian country crooner, Daniel Romano, pays tribute to the legend covering “I Can Still See Him In Your Eyes” and “There’s The Door”. Jones’ body may have been laid to rest at Woodlawn Cemetery in Nashville, but his firebolt spirit is less easily contained. Romano, in his own words, below. This song has an almost identical melody to everyone’s favourite Twitty song “Hello Darlin”. It is the title track on the possums 1973 record. The song is immediately followed by “Hello Darlin'” which was an interesting move to say the least.. Unlike “Hello Darlin'”, this song is much more stark and to the point, evoking the dark feelings and desperation that go hand in hand with jealousy. The man from the past remaining in the mind of your lover…what could be worse. Half devastating, half optimistic, this song is mostly good for its amazing vocal delivery by Jones. When the chorus hits you could swear he’s crying. The front half is a man caught in the headlights of truth and being turned away. The second, a self-discovery and a thought of a chance at another chance. I don’t know what it says about me, but I prefer the front half. I saw Daniel do “I Can Still See Him In Your Eyes” in Austin, Texas…the day that the Possum passed away. It was sooooo well done. Daniel could have done an entire show of George Jones songs. Man, that was awesome. Of course, that would have deprived us of Romano’s excellent lyrics! Keep it country, Daniel – you are the best! Gorgeous performances. New fan of Daniel’s old soul music. Grateful a straight ahead country artist is getting exposure. About every ten years or so a musician like Daniel Romano comes along to restore my faith. I feel a little like Simeon must have felt when he finally saw the infant Jesus carried into Jerusalem: “… now lettest thou thy servant depart in peace, according to thy word: for mine eyes have seen thy salvation,which thou hast prepared before the face of all people…” For another generation, at least, country music is safe from extinction.